Cilantro Recipes – Cilantro Recipe – Recipes With Cilantro | Cook Eat Delicious! Cilantro isn’t for everyone. It can be to strong or not tasteful to some. To others, it is aromatic and delicious! I like to incorporate Cilantro into some of my favorite Mexican Recipes. It is essential in pico de gallo and other salsas. 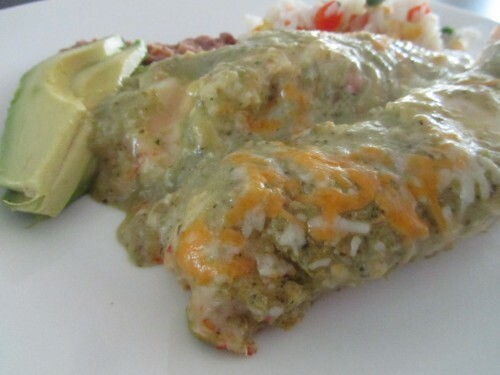 I also love a good Cilantro cream sauce on enchiladas. But too much cilantro can taste soapy sometimes, weird how herbs or spices can change depending on quantity and how they are cooked. Are you a cilantro lover or hater, or just the tolerater? Check out the following Recipes with Cilantro for ideas for your next meal. With the exception of Restaurant Month last month I have been a little MIA. Not just from this blog but from the kitchen too. Once I stopped putting up recipes regularly it became a lot more difficult to even do so once in a while. I was in a funk and I am thinking I may be out of it…maybe. We just moved into a little cute apartment, closer to the water and closer to town. When I say ‘little cute’ I actually mean ‘super small, help! I can’t move around in the kitchen’ apartment. Alas! Life goes on and I gotta start cooking again sometime. Fish Tacos was the way to go and get up out of my dry cooking spell. I love fish tacos and when we lived in Mexico DH and I really got addicted to fish tacos at a little joint in our town. The fish was fresh and served in warm flour tortillas. We used to go there for lunch at least twice a week but since we moved to Costa Rica we haven’t had fish tacos at all. I think this recipe may become a regular weekly thing for us now. 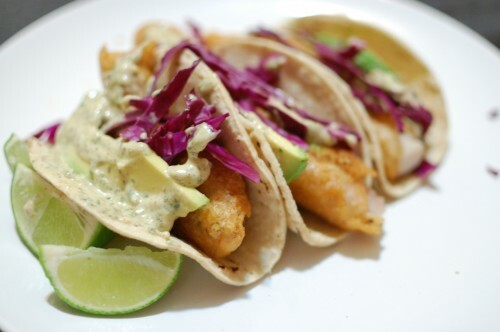 Delicious Rating: Fish Tacos have never tasted so good! The beer batter is not that super thick kind that tastes mushy half way through biting it but rather it really coats the fish and fries up nicely and stays crispy too. I used Tilapia fillets and loved their flavor but you can use any firm white fish you prefer. The cream sauce…OMGoodness. Like seriously, it is pretty the bomb. I kept eating it by itself. It is spicy and has a great cilantro flavor and complements the fish very well. I used corn tortillas and they were great but next time I think I will stick to flour. Just personal preference. When I was watching one of the many season of Top Chef I started getting curious about Polenta. It seemed that every chef on the show would cook with it in one challenge or another. I just assumed I would never find Polenta here in Mexico but sure enough there it was at the grocery store. It is exciting to cook with a new ingredient, something you may never have even eaten before. I felt like I was on a Top Chef quickfire challenge and I had to think of something fast! This Polenta Recipe came to mind…but not as fast as those chefs think up easy recipes. 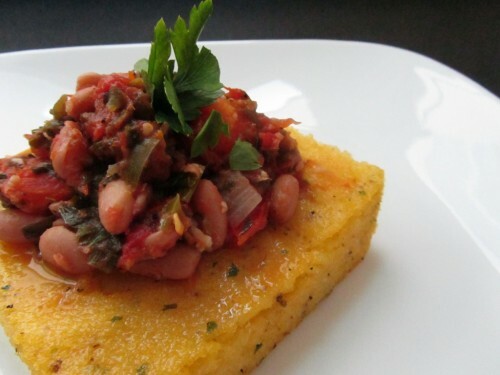 Delicious Rating: If you are not using quick cooking polenta make sure you continue to whisk and whisk hard! If you are not a cilantro fan than this recipe may not be for you. It is geared up with cilantro and some spiciness from the peppers in the salsa. I have to say that it was good and different. I really didn’t know what to expect. My DH enjoyed it and asked for me to make it again one day. I will for him but not for myself. It just didn’t do anything for my palate. Let me know what you think in the comment section! Meaty, spicy, cheesy, gooey…yummy! Enchiladas are one of the easiest and most delicious Mexican dishes to make. And there is so much variety in what you can do to the dish. Casseroles are great for families, entertaining, or for an easy and quick dinner. If you aren’t a fan of cilantro you can certainly leave it out. I don’t mind cilantro but too much is too much. So you can certainly adjust it to taste. Serve these enchiladas with rice & beans to make a complete dish. Delicious Rating: Any home cook can whip these up. They are extremely delicious! However, I am a sucker for anything with cheese so maybe I am being a bit bias here. All the flavors seem to meld perfectly. The use of green tomatillos adds such a depth in a sauce that the usual red tomato does not give. You can use an already cooked rotisserie chicken to save time as well. I highly recommend this easy recipe and will make them again myself. Please let me know what you think of them or if you made any improvements or adjustments.